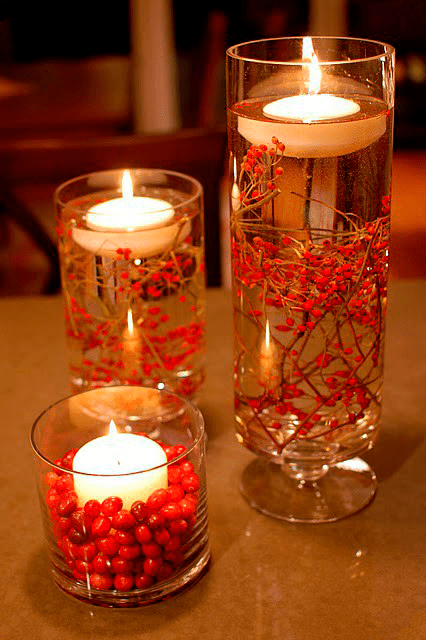 Nothing says DIY Christmas Decorations like this collections of candle centerpieces and accents. These 5 classic DIY Christmas Centerpieces are a few of our favorites we’ve found floating around the web with the perfect blend of nature, color, winter and Christmas spirit. 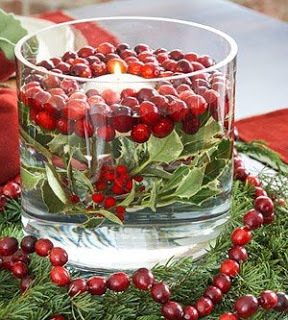 Cranberries and variegated holly make this simple floating candle into an elegant table centerpiece. 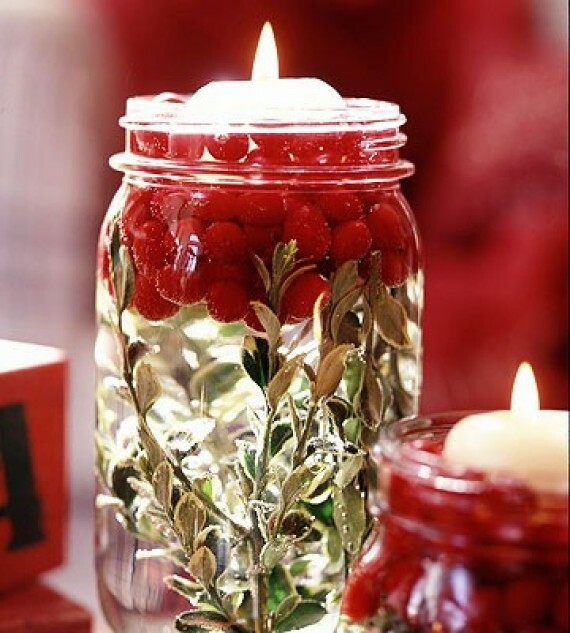 All you need for this simple centerpiece – Cranberries, holly leaves, candles, and a glass cylinder or vase! 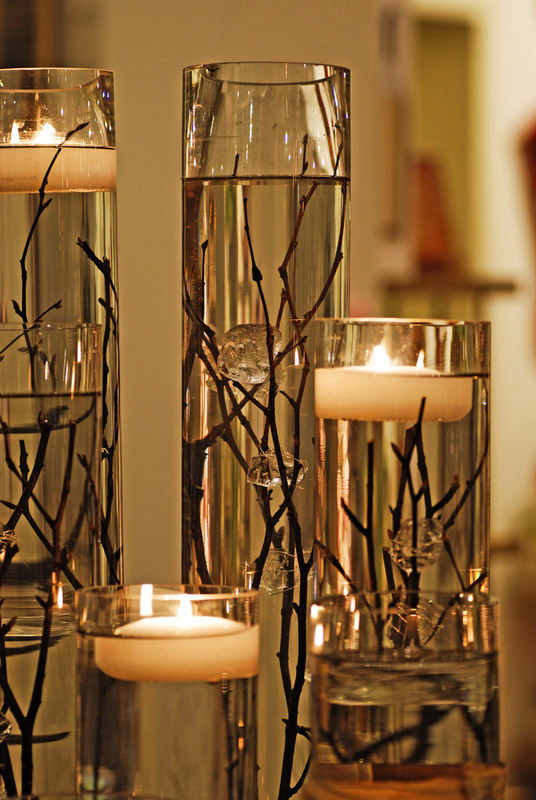 All you need for this elegant display are some twigs, metallic crafting wire, tumbled glass, tall vase and floating candles. Fasten a few pieces of tumbled glass to the twig and arrange then in the vase. Fill the vase with water and add the candles. For detailed instructions follow bellow. You can also skip the tumbled glass, and use plain twigs for a simple, elegant feel. We simply loved this country style mason-jar floating candle. Use a recycled jar or purchase a few. 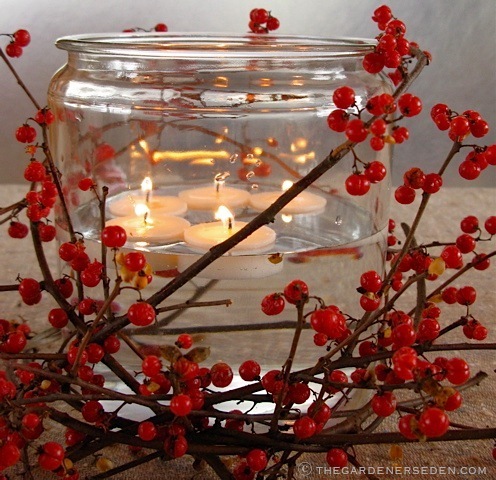 Fill with water and add some mistletoe (or greenery of your choice, holly looks beautiful as well), fresh cranberries and add a candle for and elegant country Christmas. 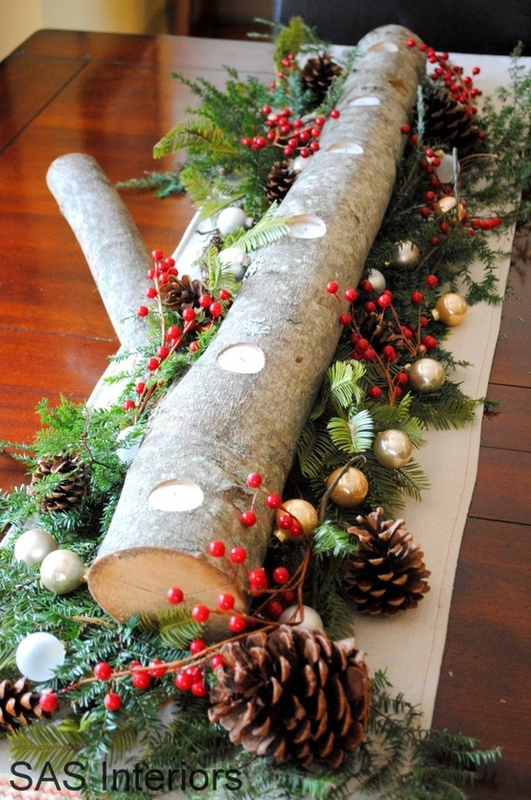 This rustic Christmas mantle-piece or centerpiece makes a stunning addition to your Christmas decor. To get started you’ll need a log, a drill and a 1.5 inch drill bit, hammer and chisel and tea candles or votive candles. If you use votive candles, be sure to use a glass cup so you can easily change the candles. Add a warm Christmas glow with this beautiful candle trio. These use rose hips, but feel free to use whatever Christmas berries you have. Make sure not to overfill the vases, and use several sizes for more fun. Simple, rustic, and stunning. 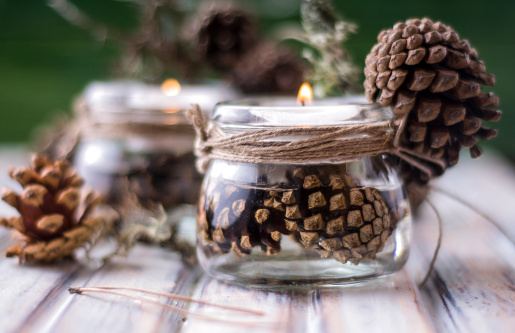 Add a few small pine cones to a small candle holder, fill with water and add a votive. Wrap the top with pain twine, or twine and gold thread for added detail. Wrap a large jar with bittersweet berries, or whatever berries you have available. Fill the jar with water, add several floating candles. Add a few sprigs of holly or mistletoe if you prefer a little green.